First penny Bun I've seen this season!! walking in Cumbria last Friday 3rd August!! Usually arrive earlier up here but like everywhere has been really dry! No sign of any Chanterelles yet though!! at a guess we need a bit more rain and a few degrees cooler round here to get em going. 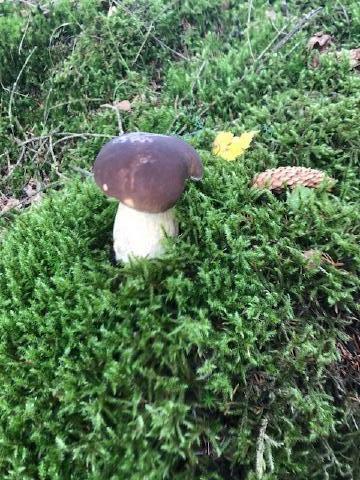 the birch boletus a bit along the road usually precede em by a couple of weeks and no sign of them yet either. as an aside last winter was rather odd for cold weather ones, imho too warm to start and then cold a bit too late . Found a chicken of the woods last Friday. Perfectly tender, but I had to move on before eating it, left with Mrs. Slim in the fridge. I will be visiting a site I know where there is chicken of the woods in about 3 weeks, so will look out for it. I will leave it where it is though. As it has been very dry here it might not have come out yet though. left with Mrs. Slim in the fridge. Is she not a bit cold? Sorry, I'll get my coat! anyway , weeks later site 2 had a flush so i have a kilo or so in the dryer, site one is usually a week later than site 2 so i still have hope for at least a few this year. not a very good year, i recon i got less than 4kg and only 2 batches for drying. the good news is that although i missed the flush a trio of birches i inoculated last year had some of the biggest ( well wormy and slimey when i found em ) ceps i have ever seen. a small aside, although there are quite a lot of autumn shrooms there are a lot less than the last few years and while some old pals are missing there are quite a few i have never noticed before and ain't ided yet. Apart from the magpie inkcaps, which aren't edible, we haven't had that many yet. I have found a few in odd places, but not that many yet. Had a few parasols this year but nothing else. I long for giant puffballs but haven't seen any here for years, I was rather shocked when I first saw them, but (apart from chanterelles) they are almost my favourites! Interesting observations - speaking personally, it's been the most spectacular year for Ceps for many years. Not much in the way of other shrooms (except other boletes). Last two or three years have been pants, so very welcome. I couldn't agree more with JP. Absolutely spectacular year. I've been dyingto post pictures,but not had much time. Will do so soon. Any pictures you fancy sharing JP et al? blewits delux at the mo. Not for foraging, but it seems to have been a good year for magpie inkcaps too. Saw some on a roundabout near us. I think they are generally uncommon, but seem to have taken to the area round our firewood cutting and also the recently laid woodchip on the roundabout.